Market experts weigh in on what the market volatility says about 2019 from CNBC. Stocks plunged again on Friday, sending the Dow Jones Industrial Average to its worst week since the financial crisis in 2008, down nearly 7 percent. The Nasdaq Composite Index closed in a bear market and the S&P 500 was on the brink of one itself, down nearly 18 percent from its record earlier this year. 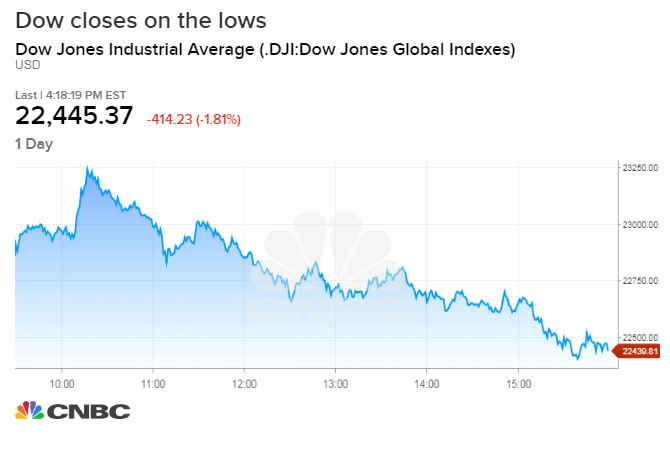 The Dow Jones Industrial Average fell 414.23 points to finish at 22,445.37 in turbulent trading that sent the blue-chip index up as much as 300 points earlier in the day, only to trade back in negative territory less than one hour later. The initial rally upward on Friday came as Federal Reserve Bank of New York President John Williams told CNBC that the central bank could reassess its interest rate policy and balance sheet reduction in the new year if the economy slows. But those gains slowly disappeared as investors used that short-term pop as a chance to sell more. The broader S&P 500 fell 2.1 percent on Friday to close at 2,416.58, while the tech-heavy Nasdaq Composite shed 2.99 percent to 6,332.99 with big losses in technology stocks including Facebook, Amazon and Apple. Stocks accelerated to their lows after President Donald Trump’s trade adviser, Peter Navarro, told Nikkei that it would be “difficult”for the U.S. and China to arrive at a permanent economic agreement after a 90-day ceasefire in the trade tensions. The selling had conviction. More than 12 billion shares changed hands on U.S. exchanges on Friday, the heaviest volume in at least two years. The expiration of options also added to the volume. On Thursday, the Dow Jones Industrial Average dropped 464.06 points to close at 22,859.6, bringing its two-day declines — which encompassed the market’s reaction to the Fed’s rate hike — to more than 800 points. The S&P 500 shed 1.58 percent to end Thursday at 2,467.41 while the Nasdaq Composite fell 1.6 percent and closed at 6,528.41. “What we’re going to be doing going into next year is re-assessing our views on the economy, listening to not only markets but everybody that we talk to, looking at all the data and being ready to reassess and re-evaluate our views,” he said. But equities quickly staged an about-face thereafter. The Fed’s decision to raise the benchmark overnight lending rate by one quarter point on Wednesday triggered a new wave of selling across Wall Street earlier in the week. That move was widely expected by markets but investors appeared to be taken off guard by Fed Chairman Jerome Powell’s comments that the central bank was satisfied with its current path to reduce the balance sheet with no plans to change it. The Fed currently is allowing $50 billion a month to run off its massive debt balance sheet as its securities mature, tightening financial conditions. The balance sheet is mostly a collection of bonds the central bank purchased to vitalize the economy during and after the financial crisis. Later on Thursday, the House passed a temporary spending bill with more than $5 billion for Trump’s border wall — an inclusion which will likely impede its ability to clear the Senate. The Senate had unanimously approved a bill Wednesday night to keep the government running through Feb. 8 — without border wall money. However, Trump later told reporters on Friday that there is a very good chance the House funding bill will not pass in the Senate and that the administration is prepared for a long shutdown. Technology and financial stocks were among the biggest losers on Friday. Facebook lost 6.3 percent, Apple lost 3.8 percent and Amazon lost 5.7 percent. Chipmakers Nvidia and Advanced Micro Devices lost 4 percent and 5.6 percent, respectively. The big banks of Wall Street also sank, with Goldman Sachs falling 4.9 percent, Citigroup down 3.8 percent and Bank of America down 3 percent. Athletic apparel company Nike was one of the few bright spots rallying nearly 7 percent following strong earnings results. — CNBC’s Sam Meredith, Eustance Huang, Kate Rooney and Jacob Pramuk contributed to this report.